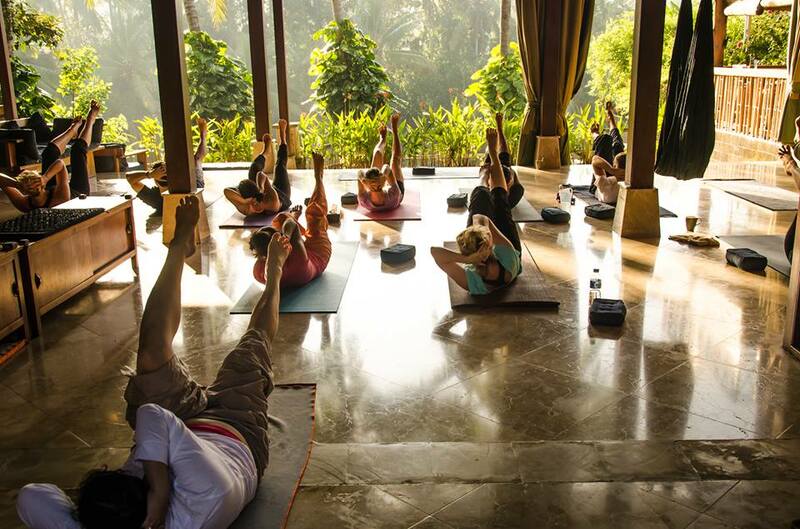 Juice Cleanse, Yoga & Detox Retreat in Beautiful Bali at Villa Gaia! Getting healthy doesn’t have to be hard, and you don’t have to go at it alone. . . WELCOME TO YOGALATES BLISS ~ YOUR GATEWAY TO HEALTH AND WELLNESS IN DUBAI! We all know by now that Yoga and Pilates improves your posture and core strength. At our signature Yogalates sessions, we combine the best of both to explore the layers that make up your core then work to build strength and tone in those muscles. Building greater strength in the core is the one thing EVERYONE needs in order to transition smoothly between standing postures, side bends, balancing sequences, spinal twists and invigorating chest openers. Explore these benefits and much more at Yogalates every Monday + Wednesday in the refreshing outdoors at Fraser Suites Dubai! On an annual basis, we cherry pick a multi diverse range of Yoga Alliance Registered Trainings led by senior guest teachers from across the world to inspire you in becoming your best as a confident student, empower you in becoming a strong yoga teacher and support you in continuing your education with advanced intensives. At Bliss, we preach the outdoors, nourishing meals and adventure. We've teamed up with Gaia Retreat Center in Ubud, Bali to refuel your soul with their award winning yoga & detox retreats, transcendental meditation retreats and an opportunity to host your training at the beautiful villa nestled in the rice fields. And if you are a wellness / health professional looking to setup your own wellness business in Dubai from healthy foods concept, fitness event or exhibition, yoga or pilates studio, to 'how to' build your private clientele base, I can assist you along your path of growth in your business with over 8 years of marketing and management consultancy services specifically geared towards the UAE's progressive wellness scene. Feeling the need to turn inward and embark on a happy gut diet to reduce inflammation and banish bloat & fatigue for good? We all know gut health is important, affecting everything from digestion to immunity to mood, heart health, oral health and more. Ranging from 3-5-7-10 Days, Gaia Retreat Center’s Signature Detox program in Bali, will help you achieve optimal wellness with delicious fresh plant-based food, nutrient-dense juices, cherry picked wellness excursions from floating sensory deprivation, sound healing, nutritional talks, herbal body products workshop and treatments from colonics to abdominal healing massage, yoga, to renew your body, mind, and spirit. We’ve guided thousands of participants around the world through juice fasts and cleanses that makes detoxing gentle, effective, delicious, and fun so that you have more energy and walk away feeling rebirthed. The recipes consumed are loaded with nutrients and delicious. You’ll come to realize that eating vegan meals and detox juicing isn’t restrictive and bland. It’s quite the opposite. You will also learn how to recreate the juices consumed to continue your nourishing journey back home. Our Signature Personalized Detox and Yoga Retreat, Private Transcendental Meditation Retreat and curated Wellness Group Retreats at Gaia Retreat Center in Bali, have been running for over 8 years combining detox, yoga and meditation – to all backgrounds and walks of life who are dedicated to spiritual transformation, personal development, creativity, prosperity, health and wellness. They are designed with guidance, full support, and a concrete action plan to open your heart and no longer define yourself through old mental patterns and eating habits while starting to act in a way that is more aligned with your true self. Expand your career options while guiding moms through their exciting new journey and preparing them physically and mentally, for a healthy and powerful transition of childbirth. Sally has been teaching health and fitness since 1998 and has studied and taught pregnancy and post-natal yoga extensively since 2007. Her style of yoga is from the lineage taught by guru Uma Dinsmore-Tuli, a leader in the field of women’s well-being, whilst also weaving an element of exercise physiology, Pilates and movement methods gained from her studies in exercise rehabilitation in to her teaching. Now a mother of two lively little girls, Sally continues her studies and has trained as a doula with Michel O’Dent and with Jennifer Walker of Spinning Babies, and has penned many articles for major publications. Also the author of The Student’s Guide to Yoga Anatomy and teacher on movementformodernlife.com. Sally is now a certified Experienced and Senior Yoga Teacher and teacher trainer, who is known for her humour, warmth and all inclusive presentations. She specialises in delivering solid and thorough pregnancy and post-natal yoga teacher training’s in the UK, over 6 trainings in Dubai and internationally across Spain and Greece. ​​Yoga related movements for all the trimesters to stretch and strengthen the physical body and help alleviate common conditions of pregnancy. Mula bandha – the importance of a healthy pelvic floor and the correct alignment of the pelvis during pregnancy and the post-natal period. Energetics; How a dysfunctional pelvic floor relates to and affects the root chakra. Appropriate relaxation, pranayama, visualizations and meditation. The spiritual aspects of pregnancy and birth. Working with an exercise ball or chair for both pregnancy and in preparation for labour. Positions for optimal foetal positioning. Birth and labour – description of a `normal’ birth using both anatomical images and a dummy baby and model of the pelvis. We also cover birth using induction, intervention, and caesarean section. Post-natal recovery including exercises and breath work following caesarean section. Basic nutrition for new mums to aid post-natal recovery. Mother and baby yoga – How to plan and facilitate a class. How to start your business as a pre and post-natal yoga teacher. T​his 7 day pregnancy yoga teacher training is open to Yoga​ and Pilates students and teachers with a minimum of 1 year consistent practice. Together we hold a clear open, welcoming space on November 17-23, 2017 for a superb training experience! Combine your passion in Yoga and love for Kids and become certified with the necessary skills to teach yoga, movement and meditation to children! GroovyKids™ Yoga Teacher Training presented by the contagious energy and expertise of Global instructor Greville Henwood is a 15-hour course that equips you to teach so much more than just kids yoga! Marking its 9th return to Dubai with back to back sell out, Greville is looking forward to empower you to look at the different ways to engage with children, delve deeper into the technical understanding of poses and how they can be sequenced together to create infinite classes for kids of all ages. You will learn how to play games to harness kids energy and enthusiasm and the GroovyKids™ Yoga Flow [45-60 minute] which is a complete range of motion yoga class including music, movement, breath awareness and meditation. Not only can meditation bring about immediate behavioral changes in children, but it can also teach them how to make difficult life decisions, feel connected to the world around them, reduce hyperactivity, short attention span, sudden impulsive behavior and daily stress from school exam, sports competition, family pressure and much more. Implement 7 Keys to a successful GroovyKids™ Yoga class. How to prepare and organize the room. GroovyKids Yoga Sequences and LOGIC behind each approach. Poses to avoid depending on age groups. Modifications for different age groups [3-5 / 6-12]. Incorporating creative games and partner work. How to categorize poses smartly. Brief comparison of teaching kids and adults. Watching Greville teach a live kids demo session on day 2. Qualities of a yoga teacher and confidence. How to offer individual attention to every child in a group setting. Class control, discipline and rewards. Teaching restorative yoga, meditation and breath control. On the final hour of the final day, we invite all parents to bring their children in for a 1 hour live demo class led by Greville where you can watch theory being put into practice. Parents, school teachers, yoga / fitness instructors and anyone who wishes to teach the non competitive spirit and life changing benefits of yoga to kids are invited to enrol. The training will be held at Voyoga studio in i-rise tower, Tecom, Dubai – click here to watch our past training held at the sunny venue and where you’ll be based in November. T​his 7 day pregnancy yoga teacher training is open to Yoga​ and Pilates students and teachers with a minimum of 1 year consistent practice. Together we hold a clear open, welcoming space in November for a superb training experience! Dubai GroovyKids Yoga Teacher Training returns on November 10-11, 2017! Combine your passion in yoga and love for kids under the expertise of Global Instructor Greville Henwood and become empowered with the necessary skills to teach kids yoga, movement and meditation in Dubai, on November 10-11, 2017. As a trainee on this extremely joyful weekend training, you’ll learn the GroovyKids Yoga​™ flow [45-60 minute] complete range of motion yoga class using music, breath awareness and savasana techniques. You’ll also learn unique brain + body coordination exercises, how to build strength, stability, focus, balance & learn games to harness kids energy and enthusiasm. We practice yoga sequences to share yoga philosophically with kids and meditation that can help so much with stress as kids grow up. The training is very practical, interactive and extremely fun! GroovyKids is proud to mark its 9th return to Dubai and this 15hr yoga alliance course hosted at the beautiful space of Voyoga studio. This kids yoga teacher’s training is open to anyone who has a love for kids and has a background in yoga practice – no specific level or experience required. WELCOME TO BALI’S LEADING DETOX, YOGA AND MEDITATION RETREATS AT VILLA GAIA! Welcome to Gaia Retreat Center located in Ubud – the most desirable location in Bali and voted the friendliest town in Asia! If you’ve been craving a change in your life and wish to give yourself a gift of personal growth & energy, then our tailored detox retreat packages and 5 day transcendental meditation private retreats are an excellent choice for your mind-body-spirit. At Gaia Retreat Center our mission is to establish a foundation that supports the energetic statement that the more you give the more you receive. The view from Villa Gaia is quintessential Bali. Think swaying palm trees and lush fruit trees line the edges of terraced rice fields that extend into the distance with a private stairway access to the rice fields and organic farm for wonderful morning walks. From your front door of Villa Gaia, you can take a leisurely 15 minute stroll to town to a vast array of markets, shops & delicious world class restaurants including Locavore, Hujan Locale, Seniman Cafe, Seeds of Life, Kismet, Earth Cafe and a plethora of healers, spas, yoga studios and markets, easily found along the main roads of this small town. Ngurah Rai International Airport (Bali’s international airport) is just 60 minutes away from our villa making it a relaxing destination to travel to. Exploring the island is a must and our friendly staff can arrange tours during your stay. Since Bali is a fairly small island, you can plan many exciting adventures and day’s trip around the island while you detox at our villa. The grand entrance of the retreat center opens up to the marble and teak wood that has 8 bedrooms, 9 bathrooms, private spa room with sauna and hot tub, full Western-standard kitchen, private catering kitchen, dining room, large screen projection cinema room, full staff and a beautiful infinity pool with decks and views to awe and soothe any wired soul to bliss. Gluten intolerant? Well, did you know that Buckwheat is a seed and a relative of the rhubarb fruit which has nothing to do with wheat? Buckwheat is actually gluten free! And we all know that breakfast is important because it sets the tone for how you feel throughout the rest of your day. Once you start with a healthy, nutritious and filling breakfast, it is highly likely you will continue to choose healthy choices. This Sprouted Raw Buckwheat Granola with Peach & Apricot recipe is one of Chef Mia of Graciously Green‘s favorite breakfast creation and a taster to many recipes you’ll learn how to create using the power of the food dehydrator at her upcoming Raw Food Chef Training on May 5-10, 2017 held at Tom&Serg in Dubai. First soak your buckwheat groats in water for an hour and rinse. Then leave covered in a sieve or colander for up to 48 hours [rinsing every few hours] until you see small tails appear. You have now activated your buckwheat and you can eat it in it’s raw state once dehydrated. In a large bowl, add the buckwheat to the other ingredients and combine with your hands. Next place all the mixture onto dehydrator trays – make sure to spread the mixture out so that it has enough room to dry. Store in airtight container for up to 4 weeks. *We now have 12 spots left at our inaugural training!